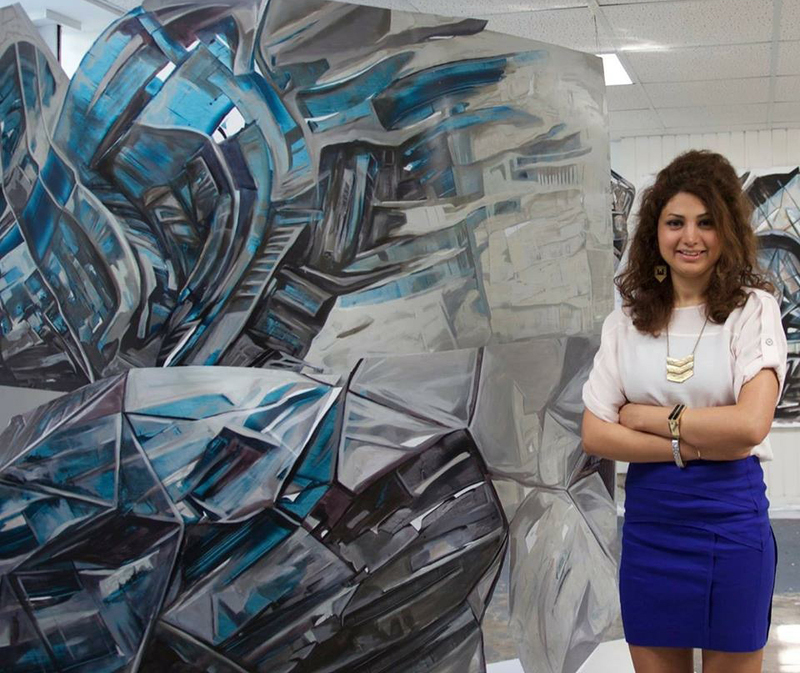 Zahra Nazari stands next to her work, “Urban Facade Installation,” 2015, Acrylic on Shaped Industrial Aluminum, 48″x96″x20″. Zahra Nazari ’14g (Painting/Drawing) is living proof of art’s power to speak to people across borders and cultures. Her journey as an artist has taken her around the world, from her hometown of Hamedan, Iran, where she first discovered her passion for painting, to SUNY New Paltz, where she earned her Master in Fine Arts degree. It was during her time at New Paltz that Nazari first established a professional foothold in New York City, thanks in part to a support network of Department of Art faculty (she thanks Robin Arnold, Kathy Goodell, Amy Cheng, Jill Parisi, Emily Puthoff and Matthew Friday, among others). 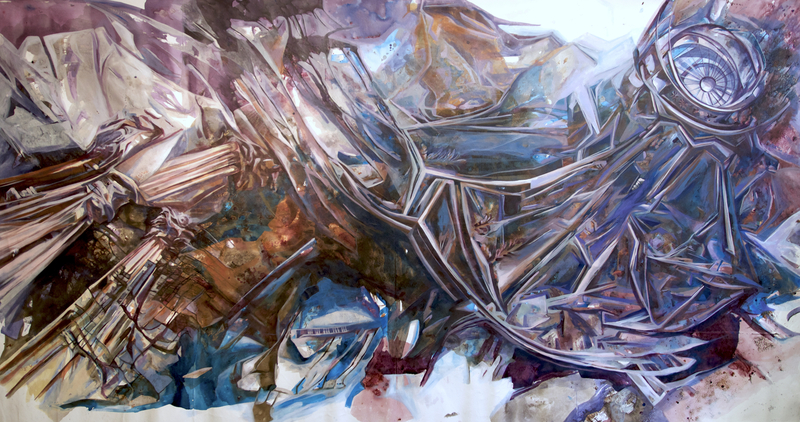 Zahra Nazari, “Melody of the Oculus,” Federal Hall, 2017, Acrylic on Canvas, 80×150 in. Courtesy the artist. Nazari has enjoyed remarkable early career success since graduating from New Paltz. She has participated in the AIM program at Bronx Museum, the Immigrant Mentoring Artist Program at the New York Foundation for the Arts, and an artist residency at MASS MoCA. She’s also served as a teaching artist in residence at the Cooper Union. Her most recent solo exhibition “Remnants” was on view at Five Points Gallery last fall, and was the subject of a feature in ZH Magazine – extra meaningful as it is one of the leading arts publications in Nazari’s home nation of Iran. For Nazari, internationality is more than just a means achieving professional success; it is her lived experience, and increasingly a primary inspiration for her work. That continued in October 2017, when she was selected for the Tao Hua Tan Artist Retreat and Residency, which brought together about 40 artists from around the world to work together and be inspired by the architecture and landscape of the Yellow Mountains. 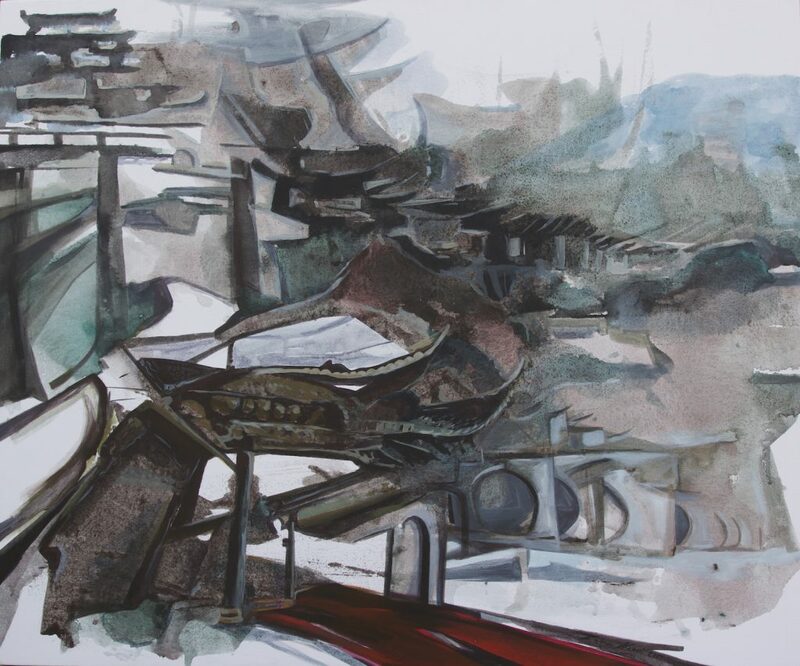 Zahra Nazari, “Tao Hua Tan Gate,” 2017, Ink & Acrylic on Canvas, 40×47 in. Courtesy the artist. Next up is another residency in Krakow, Poland, adding one more stamp to her rapidly-filling professional passport. Visit http://zahranazari.com/ to learn more about this artist and where to see her work.